SpaceX Dragon capsule departs the International Space Station in May 2014. 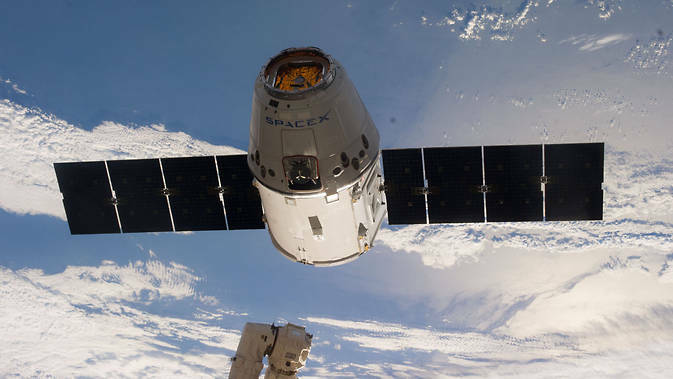 The sixth SpaceX cargo mission to the International Space Station under NASA's Commercial Resupply Services contract is scheduled to launch on Monday, April 13, from Space Launch Complex 40 at Cape Canaveral Air Force Station in Florida. NASA Television coverage of the launch begins at 3:30 p.m. EDT. The company's Falcon 9 rocket will lift off at 4:33 p.m., carrying its Dragon cargo spacecraft to the station. Dragon is filled with more than 4,300 pounds of supplies and payloads, including critical materials to directly support about 40 of the more than 250 science and research investigations that will occur during the space station’s Expeditions 43 and 44. In addition to launch coverage, NASA also will host a series of prelaunch news conferences on Sunday, April 12, at the agency's Kennedy Space Center in Florida. All briefings, which are subject to a change in time, will air live on NASA TV and the agency's website. During panel discussions Sunday at 1:30 p.m. and 3:30 p.m., scientists and researchers will discuss the onboard science and research studies. The series of briefings will conclude with a prelaunch news conference at 5 p.m. A post-launch briefing will be held approximately 90 minutes after liftoff Monday. Science investigations launching on Dragon include commercial and academic payloads in myriad disciplines, exploring new ways to possibly counteract the microgravity-induced cell damage seen during spaceflight; studying the effects of microgravity on the most common cells in bones; gathering new insight that could lead to treatments for osteoporosis and muscle wasting conditions; continuing studies into astronaut vision changes; and testing a new material that could one day be used as a synthetic muscle for robotic explorers of the future. A Monday launch will have the Dragon spacecraft arriving at the space station Wednesday, April 15. Expedition 43 Flight Engineer Samantha Cristoforetti of ESA (European Space Agency) will use the station's 57.7-foot robotic arm to reach out and capture Dragon at approximately 7 a.m. Flight Engineer Terry Virts of NASA will support Cristoforetti as they operate from the station's cupola. NASA TV coverage of grapple will begin at 5 a.m. Coverage of Dragon's installation to the Earth-facing port of the Harmony module will begin at 9:15 a.m.
After about five weeks at the space station, Dragon will return to Earth filled with more than 3,000 pounds of cargo including crew supplies, hardware and computer resources, science experiments, and space station hardware. If the launch doesn’t happen on Monday, the next launch opportunity would be at approximately 4:10 p.m. Tuesday, April 14. The deadline for U.S. media to apply for accreditation is noon on Thursday, April 9. The application deadline has passed for international media. Media credentials will be valid for mission activities from launch through splashdown at Kennedy and at NASA's Johnson Space Center in Houston. For more information about media accreditation, contact Jennifer Horner at 321-867-6598 or jennifer.p.horner at nasa.gov<mailto:jennifer.p.horner at nasa.gov>. The IAU is the formal authority for naming celestial bodies. Submissions must follow a set of accepted themes and guidelines set out by the IAU’s Working Group for Planetary System Nomenclature. After the campaign concludes, NASA’s New Horizons team will sort through the names and submit its recommendations to the IAU. The IAU will decide whether and how the names will be used. The campaign allows the public of all ages to submit names for the many new features scientists expect to discover on Pluto following the encounter. New Horizons already has covered more than 3 billion miles since it launched on Jan. 19, 2006. Its journey has taken it past each planet’s orbit, from Mars to Neptune, in record time, and now it’s now in the first stage of an historic encounter with Pluto that includes long-distance imaging, as well as dust, energetic particle and solar wind measurements to characterize the space environment near Pluto. The spacecraft will pass Pluto at a speed of 31,000 mph taking thousands of images and making a wide range of science observations. At a distance of nearly 4 billion miles from Earth at flyby, it will take approximately 4.5 hours for data to reach Earth. The Johns Hopkins Applied Physics Laboratory (APL) manages the New Horizons mission for NASA’s Science Mission Directorate in Washington. Alan Stern, of the Southwest Research Institute (SwRI), is the principal investigator. SwRI leads the science team, payload operations and encounter science planning. 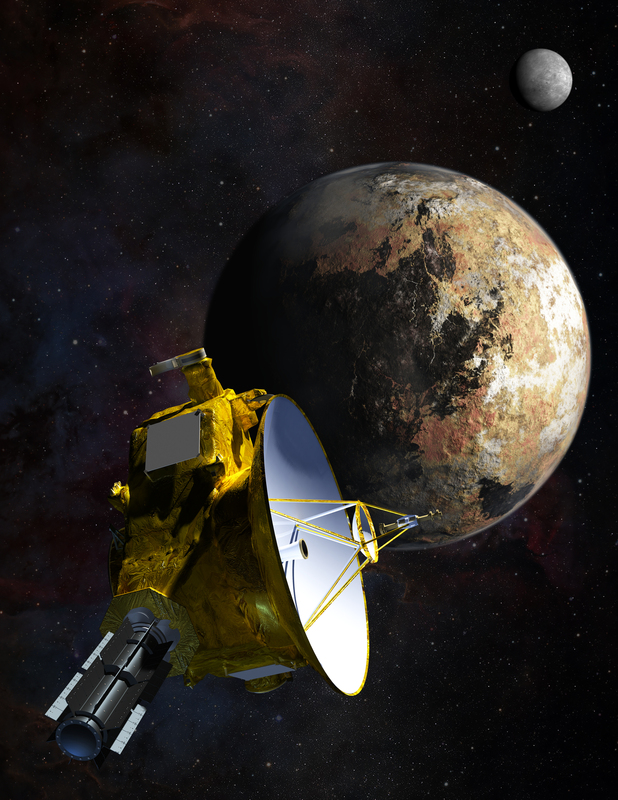 New Horizons is part of the New Frontiers Program, managed by NASA's Marshall Space Flight Center in Huntsville, Alabama. APL designed, built and operates the spacecraft for NASA. Atlantis moved today to OPF 2 for the last time, as Endeavour rolled into the VAB for the final time before her flight to Los Angeles in September.